This attractive wooden tea set is the perfect addition to your child's play kitchen. We love the red, green, and yellow accents on handles and teabags. Your little one will have a blast hosting make believe parties. It's time to “steep” into imaginary fun. Set contains two cups with saucers, one teapot with lid, one sugar bowl with lid, two sugar cubes, two teabags, one cream pot and two spoons. This tea set is very well made and totally adorable. It was a big hit for the 3 year-old I bought it for. PlanToys strives to use environmentally safe, responsible and sustainable methods to produce their toys. Their toys are made with clean, natural rubberwood from rubber trees which no longer produce latex. No fertilizer is added to the soil for 3 years before the trees are cut. 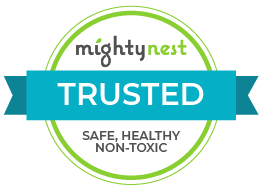 Toys are assembled using a certified E-Zero Glue in place of traditional toxic wood glue. PlanToys uses only safe, non-toxic water-based colors and recycled and recyclable materials for packaging and promotions. PlanToys® meets or exceeds the following industry standards: ASTM & EN71, ISO 9001, OHSAS 18001, SA 8000 to ensure a worry-free playtime for your children.